Washington car transport is the end of the distribution line in America. To the west is the Pacific Ocean and Canada to the north. Few people are just passing through, or at least that’s the case when it comes to auto shipping. Let’s get straight to the point, shall we? Shipping a car from the state of Washington to almost anywhere is relatively easy. Nobody is really all that sure why? There seems to be a perpetual imbalance of vehicles shipping from Washington (always a shortage of supply), going south to California or east to the Plain States, New England and the Atlantic coastal states. Conversely, and here’s the rub, there is almost always an oversupply of automobiles, vans, SUV’s, and pickup trucks shipping to the state of Washington. We have asked many people in the auto transport industry why that is? The common answer is they don’t know. If there are 100 vehicles shipping to Washington from any region, you can just about bet there’s only 20 cars shipping from Washington on the reverse route. There’s no plausible explanation. It has an effect on pricing and you can see that with our original Washington car transport quote calculator on this page. It’s almost always cheaper shipping cars from Washington than the reverse. Try it now. Amazing, right? It doesn’t matter the time of year either, and that is very strange. For instance, the car transport snowbirds shipping to and from the cold weather states to and from the warm weather states of Florida, Texas, Arizona and California create the same supply and demand imbalance of vehicles available. The difference is that the imbalance always reverses depending on the time of year. It’s far more expensive shipping to Florida in the winter, but then it becomes far more expensive shipping from Florida in the Spring. Everybody understands why that is. In Washington state, however, it never seems to change regardless of the season. Always cheaper transporting a car from Washington and constantly more expensive shipping to there. It’s as if there’s a black hole in Washington that swallows cars and trucks, never to be seen again. We are very much the authority on the auto shipping business and our website is rich in content. We pride ourselves on our expertise. We suppose it hardly matters why there is such a disparity in vehicles being shipped to and from Washington? The important thing is that we know it to be true and account for it in our instant car transport calculator. There’s also a regional difference in the entire state of Washington, which has a population of 7,288,000 according to the 2016 estimated census. That ranks as the 13th most populous American state. However, nearly half the Washington state population resides in the Seattle/Tacoma metropolitan area. Leaving the other half spread out far and wide over the 25th largest geographical state area. 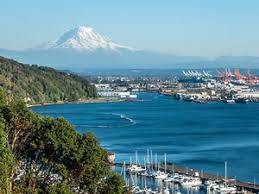 What that means is that the Puget Sound area encompassing Seattle, Tacoma, Olympia and Everett is by far the best place to ship to and from Washington. Everywhere else, with the possible exception of Vancouver situated so close to Portland, Oregon, is far more difficult. In the eastern part of the state for instance, Spokane stands alone as sudo-reliable. Yakima has a bit of a chance because it’s on I90, but barely. Blaine on the Canadian border is a bear to ship to or fro, and our Washington car transport calculator throws a bucket of cold water on the attempt. It’s high because it has to be. Bellingham isn’t much better. And on the wrong side of Puget Sound you can bet car transport carriers think twice before making that long loop of a drive. Ugh! Want some good advice? Get your vehicle on the eastern side of Puget Sound to eliminate complications and speed things along. The Interstate 5 corridor is wonderful going south to Oregon and then California. Lots of auto transport carriers heading up and down to the Los Angeles Basin and San Diego. The Bay Area too, which includes San Francisco, Oakland and San Jose. Sacramento and Modesto get thrown into that mix of reachable and reliable vehicle shipping destinations from Washington state. However, car shipments from the east have only Interstates 90 and 94 to get in and out of Washington. For a state that size, it’s really very few options. A word of caution, dear reader, in regards to the extraordinary difficulty car shipping to or from the south and southwestern states, especially Louisiana, Texas and New Mexico. It’s hard. Patience please. Look at the USA map of interstates. Can you discern an easy route from east Texas to Washington state? Not really. Neither can Washington car transport carriers. It’s not that easy to make that drive and we see enormous frustration with that route. We Love Puget Sound & Seattle! If you are going to Seattle you’re in for a treat. Imagine the San Francisco Bay surrounded by snow cap mountains. Wouldn’t that be something? Well that’s what Seattle and Puget Sound look like with beautiful bay views in a hilly city surrounded by the most gorgeous snow capped Cascade mountains. Wow! Wow! Wow! Aside from the Seattle Seahawks football and Mariners baseball teams, there’s plenty to see and do in Seattle. 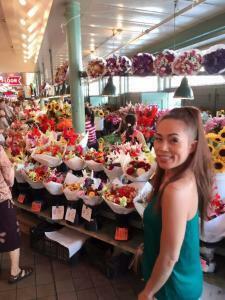 A favorite of ours is visiting the Pike Place Farmers Market in downtown Seattle. There are so many other great attractions and restaurants nearby. The seafood is spectacular! Seattle is fun to walk so bring comfortable shoes and dress in layers. The great thing about the Washington car transport quote calculator is that it gets updated weekly so that the pricing you see is most reliable. We have an incredible 5 star reputation with Google Plus, Facebook, the BBB and elsewhere. You can visit Direct Express Auto Transport to fill out a simple form and get a free car shipping quote. We make it easy to book your vehicle shipment online.